Subscribe to my YouTube Channel (Lipardo's Global Kitchen) for more recipes and future raffle draws for giveaway prizes. I love black & white, in clothing, chess game and food as well. 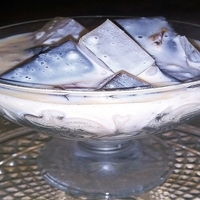 My created recipe has black & white jellies cut into squares that's why I named it chess jellies. Remember to make jellies according to package direction. I used to make jellies with the ratio 1:1 (water : gelatin powder). Subscribe to my YouTube Channel (Lipardo's Global Kitchen) for more recipes and future raffle draws for giveaway prizes. Dissolve gelatin powder in hot water. Mix well. Add instant coffee & sugar to cup 1. Stir. Add buko juice or coconut powder to cup 2. Stir. Pour each mixture on a plate. Refrigerate to set. Meanwhile mix cream, condensed milk & coconut powder.